Islands offer unique opportunities and challenges in biosecurity and conservation management. We review current and past island biosecurity within Tāmaki Makaurau-Auckland’s 1.2 million ha Hauraki Gulf Marine Park (HGMP), which includes 30 island groups, many of which are inhabited. We highlight evolving challenges and changes in island biosecurity focus. Eradication of introduced mammals from islands in the HGMP has restored mammal pest-free status to around 16 islands/island groups, i.e. over half. However, eradications are only part of island biosecurity and require follow-up with on-going vector control, surveillance and incursion response. Almost 35% of the population of Aotearoa-New Zealand lives in or around the HGMP, with hundreds of thousands of visitors to the islands each year, making human-mediated propagule pressure an important consideration in island biosecurity within the Park. The Treasure Islands public awareness campaign is an example of a multi-species, multi-agency approach to managing the human dimension of invasion risk. 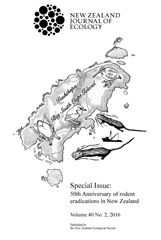 Data on introduced mammal incursions and reinvasions on predator-free islands highlight the role of both swimming and human-transport as vectors, and large inhabited islands elsewhere in the HGMP as reinvasion sources. Since 2000, biosecurity has prevented all but one incursion leading to full reinvasion. We highlight the crucial role of robust social science in supporting successful island biosecurity programmes in populous areas, and propose the Treasure Islands campaign as a case-study for providing insights into potential improvements in future use of social science in such programmes.